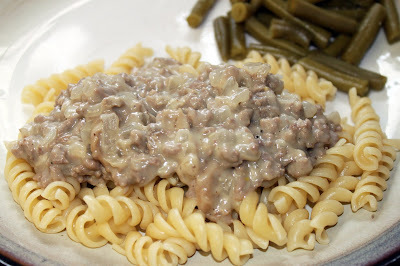 My MIL makes a dish similar to this but instead of bugging her for the recipe AGAIN, I decided to try and recreate it from what I could remember. I love the tang i-ness the mustard brings to the dish and the sour cream really completes the recipe . A great comfort meal! Heat a large skillet over medium-high heat. Crumble ground beef into the hot skillet and season with salt and pepper. Cook and stir beef until completely browned, 7 to 10 minutes. Transfer beef to a separate dish. Melt butter in the skillet over medium heat. Cook and stir onion and garlic in butter until softened, 3 to 5 minutes. Stir flour into onion mixture; cook and stir until flour is browned, about 1 minute. Return beef to the skillet; stir. Pour beef broth over the mixture in the skillet; bring to a boil. Stir Worcestershire sauce and mustard through the mixture. Reduce heat to medium-low and cook at a simmer until the consistency is gravy-like. Stir sour cream through the beef mixture and heat until warmed. Boil noodles in a large pot of water until al dente. Serve stroganoff over noodles.